That is the starting and charging system. 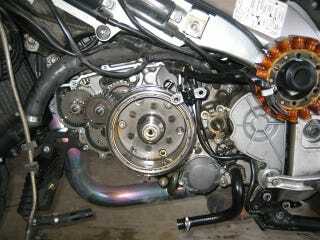 Since the starter has no bendix, there is a Sprag clutch that allows the starter to be engaged and disengaged etc. Also has something to do with the charging system since that round housing, which the sprag is inside, goes around the stator and spins creating electricity. Anyway this is the part that is suspect in my starting issue. Unfortunately to buy all the parts there that are usually replaced together is far far more than I am willing to spend. So I ordered the $15 flywheel puller tool to take everything apart and inspect it all and then replace what is broken.... I really hate this bike. I want to sell it and buy something else. I have it up for $2200 broken on CL. No bits, not even scams.